FEATURE: Will 2019 be the "Year of Acceleration" for LNG Bunkers? Peter Keller, the recent re-elected Chairman of LNG bunker advocacy group SEA\LNG, predicts 2019 will see an acceleration in decision making in favour of LNG bunkers. "If 2018 was the tipping point for LNG as a marine fuel, 2019 will be the year of acceleration," he wrote in a report posted on the group's website today, referencing the December 2017 prediction by Mark Bell, General Manager for Society for Gas as a Marine Fuel (SGMF), that 2018 would see a "surge in activity" that would make it a "tipping year" for gas-fuelled shipping. While Bell has yet to comment on whether he feels his prediction held true (we've asked), Keller today gave an extensive run down of what has happened in the LNG bunker space over the last year. The headline numbers from that report: The number of LNG bunkering vessels rose from 1 last year to 9 in 2018, the number of LNG-powered vessels was up from 118 to 143, and there are 135 LNG-ready ships either in operation or on order. Progress for sure, although nothing announced on the same headline-grabbing scale of CMA CGM's LNG-powered mega-ship order at the end of 2017. There was, however, the launch of the world's largest LNG bunker vessel, the 7,500-cbm Kairos, that began operations last month in northwest Europe. So what will drive growth in 2019 for LNG bunkers? "As the months progress, we expect to see an acceleration in decision making in favour of LNG due to three key factors: economic, environmental, and evolutionary," Keller wrote. Drilling down, "the economic case for LNG as the marine fuel of choice for newbuilds is growing stronger each month," he said. A SEA\LNG commissioned study to support that claim is set to be released later this month, and is said to show that for an Asia–US west coast liner service involving less than 10% of sailing time spent in ECAs, the greatest investment returns come from choosing LNG as the vessel marine fuel. The current industry landscape means evolutionary and environmental change go hand in hand, and both points gave Keller opportunity to double down on some of the groups key past messages. Chief among those are that the upcoming IMO2020 rule and HFO carriage ban are positive drivers for the uptake of LNG bunkers. Keller also noted Singapore and China's recently announced restrictions on open-loop scrubbing. "LNG not only addresses current local emissions regulations such as the IMO's 2020 sulphur cap but also future-proofs shipowners against tightening regulations," he wrote. "It also makes a significant contribution to GHG reductions and longer-term, the same infrastructure needed for LNG operations can readily be converted for use by non-fossil fuels such as Liquefied Bio Gas (LBG) or synthetic LNG (from power-to-gas)." Although not explicitly mentioned by Keller, GHG performance is arguably the biggest question mark left for LNG - particularly with the now-agreed IMO 2030 and IMO 2050 targets in place - and 2018 saw plenty of heated debate on the matter. A study released last year by Transport & Environment (T&E), for instance, concluded LNG bunkers were no different to conventional marine fuels when it came to climate impact. In the first quarter of this year SEA\LNG and its industry partners will be releasing their own study to calculate the GHG emissions from "well-to-wake"
SEA\LNG strongly disagree with that, with Keller writing today that "LNG is the only practical industry wide marine fuel today that provides a solution to power ocean shipping and advance the environmental standards – reducing pollutant particulates, noxious nitrogen, sulphur oxides, and GHG emissions. "So while IMO 2030 and IMO 2050 seek reductions in carbon intensity of at least 40% by 2030 and towards 70% by 2050 necessitating a move in marine fuel to non-fossil fuels, LNG offers a long-term solution for multiple ship life-cycles." The jury is still out and GHGs could still prove to be a strongpoint for the LNG argument. In the first quarter of this year SEA\LNG and its industry partners will be releasing their own study to calculate the GHG emissions from "well-to-wake". Until then, recent delays to an LNG bunkering facility at the Port of Tacoma hint at the difficulty in assessing the full lifecycle emissions of burning LNG bunkers, and why even pro-LNG players cannot agree on what the savings are. The facility is set to fuel the LNG-powered vessels of Totem Ocean Trailer Express (TOTE) where until last November Keller was also Executive Vice President, and the recent redo of the terminal's environmental report suggests gas should be sourced from Canada as methane emissions from U.S. gas production are "five times higher" than gas from its neighbour. 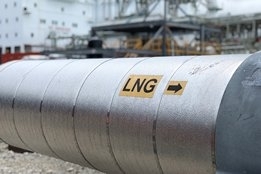 For the record, Canadian media has also cast serious doubts over the reporting accuracy of methane leaks and fugitive emissions from Canada's oil and gas industry, but nevertheless, the prospect of an LNG-powered vessel's GHG savings being dependant on where it lifts it bunkers cold prove an interesting twist in the 2019 LNG bunker story.